That’s great! Here are a few things you should keep in mind. The Toronto Disability Pride March will do it’s best to be accessible to everyone, but please bear in mind that at the present time we have no funding. Please bear with us as there may be some things we need to improve on or simply cannot afford to do, but we appreciate you input. 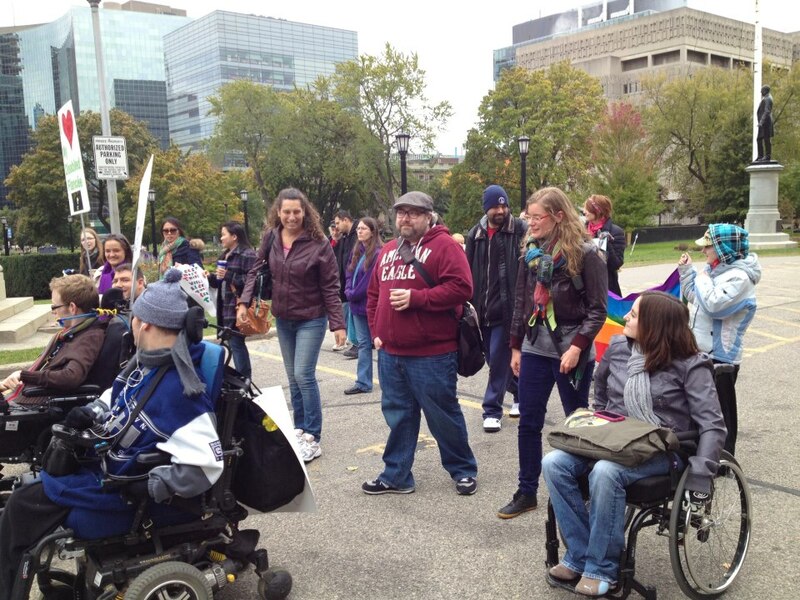 The Toronto Disability Pride March aims to stick to it’s grassroots approach. While we appreciate the support of organizations, and welcome contingents to the march. We ask organizations to bear in mind that this event is about people with all types of disabilities, their struggles and rights. Requests from organizations to put up tables, etc, will not be accepted. There are plenty of events in Toronto for organizations to do that, and we encourage you to check them out. Above all, the point of the Toronto Disability Pride March is to raise awareness, celebrate, and be proud of who we are as people with disabilities, you can take this in a political way, or just come out and celebrate with us! Either way, be LOUD be PROUD and come march with us! If you have any questions please email us at torontodisabilitypride@gmail.com.